My husband sometimes get crazy while doing grocery !! He just keep going buying without thinking quantity and sometimes quality . That’s the reason I never let him do the grocery alone !!! Few weeks ago he bought 2 large 27 oz jar of instant couscous !! He saved $2 buying these 2 packs and with a big smile of victory (!!) he told me ” isn’t it a nice deal ??”.. :O Such a fat bargain made in a fluke !! 1. Boil the 3/4 th cup of milk with tiny pinch of salt and butter . Turn off the stove . 2. Add the couscous , mix and cover the lid . After 10 minutes the couscous will absorb the milk . Now fluff it up with a fork . Set it aside. 1. Mix powder milk to the regular full fat milk and boil it with the cardamoms , cinnamon and bay leaf . Reduce the milk a bit . 2. Add the couscous and stir until it is well incorporated in the milk without having any lump . Cook a little more , like 10 minutes in a medium low heat, stirring occassioanly . 3. Add the sugar , cook another 5-7 minutes , stirring continuously . At this stage you may add some chopped nuts and raisins . Sprinkle some rose water. Turn off the stove . Don’t thicken the firni too much as it tends to thicken after cooling down . 4. Pour in a serving bowl and garnish with chopped nuts and raisins . 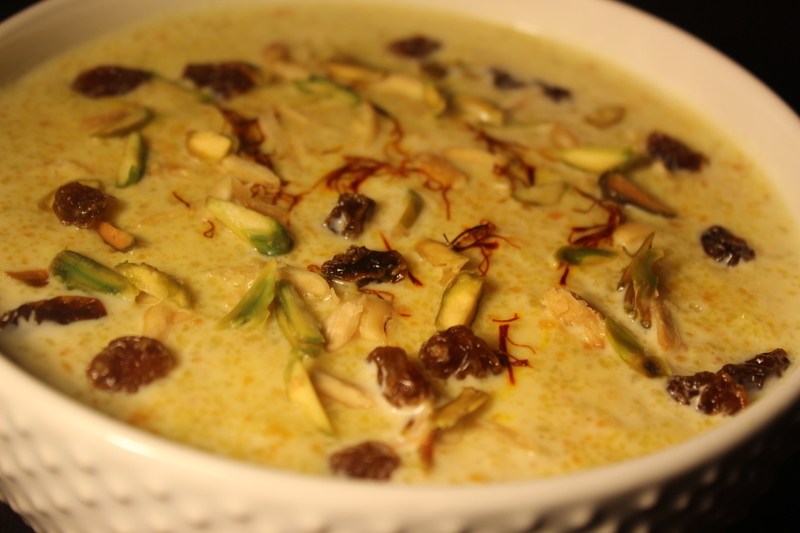 This entry was posted in Desserts and tagged Couscous firni, couscous kheer, couscous payasam, couscous payash, couscous payesh, couscous phirni, couscous recipe, firni recipe, Kheer recipe, payesh recipe. Bookmark the permalink. Phirni with couscous. Now that is a thought! apu ei firni kotojon manush ke serve kora jabe?